In old movies we were going to improve society by making everything think like a computer. Now the goal is to make computers think like brains. Researchers at Missouri University of Science and Technology say they can make power network management more efficient by literally tapping brain cells grown on networks of electrodes. The research is funded through a $2 million grant from the National Science Foundation’s Office of Emerging Frontiers in Research and Innovation. This entry was posted in brain / computer and tagged brain, internet, network on October 4, 2008 by Jay. 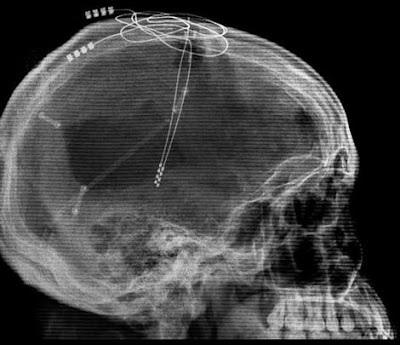 The Pentagon’s crash program to create an artificial brain is just about up and running. And, if it all goes as planned, we could see an electronic chip that mimics the “function, size, and power consumption” of a cat’s cortex some time in the next decade. Darpa, the Defense Department’s way-out research arm, is in late-stage negotiations with Malibu’s HRL Laboratories to spearhead its Systems of Neuromorphic Adaptive Plastic Scalable Electronics (“SyNAPSE“) program. The goal: Build a chip with a “neuroscience-inspired architecture that can address a wide range of cognitive abilities — perception, planning, decision making, and motor control,” a company release notes. In the following 15-month phase, HRL [a joint venture between Boeing and General Motors] will combine the synaptic and neural elements to fabricate and demonstrate “cortical microcircuits” that can model various lower-level brain functions and actually “learn” by interacting with the environment. The source article from Wired has plenty of interesting links in it. This is only a few months after Henry Markram announced he wants to build an artificial rat brain and put it in a robot rat body in only two years. This entry was posted in AI / robotics, brain / computer and tagged brain, robot on August 26, 2008 by Jay. Is your overflowing e-mail in-box a herald of the next stage in human evolution? Those e-mails represent just a small sample of the vast amount of digital information being generated by the gigabyte every minute. If we can cope with this rising flood of information, we are likely to be on track for using technology in the creation of superhuman intelligence, according to Vernor Vinge, futurist, best-selling science fiction author, and retired professor of computer science. Machines will become far more than just tools; they will physically merge with us, seamlessly endowing powers that are currently beyond our imagination. And all of this will happen in our lifetime, Vinge says. DISCOVER asked Vinge about the consequences of living in a networked world that generates and distributes more and more data every day and how to cope with information overload. This entry was posted in brain / computer and tagged machine, mind, network on August 7, 2008 by Jay. As portrayed in the 2007 movie “The Diving Bell and the Butterfly,” locked-in patients are conscious, but fully paralyzed except for their eyes. Thanks to advances in life-support technology and rising survival rates following brain-stem strokes, there may now be as many as 50,000 locked-in patients in the United States, the National Institutes of Health estimates. This entry was posted in brain / computer and tagged brain, implant on June 6, 2008 by Jay. No matter how hard you try, your mind can’t bend a spoon or channel the powers of a Jedi knight. Thanks to a new headset under development by neuroengineering company Emotiv Systems, however, you may soon be able to do this and more via the magic of video games. By the end of this year, San Francisco–based Emotiv’s sensor-laden EPOC headset will enable gamers to use their own brain activity to interact with the virtual worlds where they play. The $299 headset’s 14 strategically placed head sensors are at the ends of what look like stretched, plastic fingers that detect patterns produced by the brain’s electrical activity. These neural signals are then narrowed down and interpreted in 30 possible ways as real-time intentions, emotions or facial expressions that are reflected in virtual world characters and actions in a way that a joystick or other type of controller could not hope to match. This entry was posted in brain / computer and tagged brain, mind on May 19, 2008 by Jay. The Department of Defense is planning to implant microchips in soldiers’ brains for monitoring their health information, and has already awarded a $1.6 million contract to the Center for Bioelectronics, Biosensors and Biochips at Clemson University for the development of an implantable “biochip”.Soldiers fear that the biochip, about the size of a grain of rice, which measures and relays information on soldiers vital signs 24 hours a day, can be used to put them under surveillance even when they are off duty. But Anthony Guiseppi-Elie, C3B director and Professor of Chemical and Biomolecular Engineering and Bioengineering claims the that the invivo biosensors will save lives as first responders to the trauma scene could inject the biochip into the wounded victim and gather data almost immediately. He believes that the device has other long-term potential applications, such as monitoring astronauts’ vital signs during long-duration space flights and reading blood-sugar levels for diabetics. This entry was posted in brain / computer, cybernetics and tagged brain, device, implant on August 31, 2007 by Jay. SCIENTISTS have jump-started the consciousness of a man with severe brain injury in a world-first procedure in which electrodes were inserted deep into his brain.The 38-year-old, who had been in a minimally conscious state for six years after an assault, could only move his fingers or eyes occasionally and was fed through a tube. Now he can chew, swallow and carry out movements like brushing his hair and drinking from a cup, say the US neuroscientists who carried out the procedure, known as deep brain stimulation. This entry was posted in brain / computer and tagged brain on August 2, 2007 by Jay. I have here two movie clips that demonstrate the current state of affairs in the whacky world of mind control. The first one shows a monkey moving a mechanical arm by thought. The second one shows a guy lifting boxes in a virtual world, just by thinking about it. The technology holds great promise for disabled people. Even though this technology is being developed with disabled people as the major motive, they won’t be the only ones that end up using the technology. Imagine a day where people interact with their computer. By the time the technology hits the mainstream (at least a decade from now), computers will be small enough to be practically invisible. We will have smoothly hooked up the Internet to our brains… or our brains to the Internet. It all depends on how you wanna look at it. It might seem harmless enough, but in fact it is the beginning of our transcendance to something bigger. This entry was posted in brain / computer and tagged brain, cure, future, internet, mind on July 23, 2007 by Jay.